For the second time in a month Whitley Bay were beaten 3-2 at Morpeth Town. But in contrast to the league game, they could have no complaints on this occasion as Morpeth deservedly went through to the quarter-final of the Northumberland Senior Cup after dominating the second half of Wednesday night’s tie. 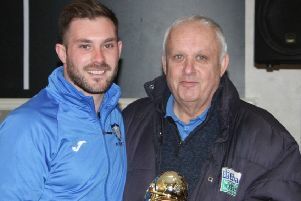 Whitley were up against former fans’ favourite and three time FA Vase winner Paul Robinson, and he tested Tom Flynn after seven minutes with a shot that the Bay keeper parried well. Shortly afterwards, Alex Kempster was brought down 20 yards from goal and he took the free kick himself, but home keeper Karl Dryden made a comfortable save. Bay’s Kyle Fryatt then made good progress down the left but from his cross Kempster fired narrowly wide. Moments later Whitley had the ball in the Morpeth net but the assistant’s flag had already been raised for offside. Whitley were having a good spell and they took a 19th minute lead following good work on the right wing by Josh Nearney, who played the ball through to Kempster who cut in and from a tight angle slid the ball under the advancing Dryden to the delight of the large following of Bay fans. Shaken by the setback, Morpeth gradually worked their way back into the game and Flynn was called into action, pushing a long range shot from Ben Sayer round the post. In the 37th minute Nearney made a crucial block to deny the home side, but Whitley battled back with Fryatt making a good run from the left wing and his cross into the goalmouth was cut out by Jordan Fry just ahead of Callum Anderson, who was surprisingly used as a strike partner for Adam Shanks. After Flynn had made a fine save to keep out a header from Chris Reid, the home side equalised right on the stroke of half-time when substitute Joe Walton headed home from close range, giving Flynn no chance. The second half saw a more determined Morpeth side take control of the game as Whitley’s threat faded. A swerving 20-yard effort from Sayer was pushed out by Flynn and then Wilkinson headed behind to clear a cross from the right. A first time effort from Shanks went past the post but most of the play was now at the other end. The pressure was growing and Morpeth went ahead just past the hour mark when Sayer struck an excellent 20-yard shot across Flynn and into the bottom corner of the net. Two minutes later a back post header from Robinson was cleared off the line, and after both sides had been frustrated by baffling decisions by the officials, tempers flared between Morpeth skipper Graydon and Fryatt. One of the most disputed decisions of the night came with 18 minutes remaining when Morpeth were awarded a penalty for a seemingly innocuous challenge on the right edge of the box. Sayer placed his spot kick into the corner of the net to make it 3-1 and the game looked all over. Despite substitutions, Whitley made little further impression on proceedings until the last five minutes, when substitute Andy Robertson tried his luck from distance and his shot clipped the outside of the post. Then with little more than 60 seconds of normal time remaining, Whitley were awarded a free kick 25 yards out and Callum Patton curled the ball beyond the unsighted Dryden into the corner of the net to make it 3-2 and briefly give hope of forcing extra time. But there was to be no fairytale ending. Despite the close scoreline, it was a rather lacklustre Whitley that went out of a third cup at the first hurdle, a dismal record in knockout competitions this season. Whitley Bay: Flynn, Nearney, Munro (Gibson 70), Wilkinson, Allen, Anderson (Patton 58), Fryatt, Fowler, Shanks, Haley (Robertson 65), Kempster. Subs not used: Powell, McDonald.